Home Best In Today 16 Random Photos That Will Make You Smile. Amazing things happen every second of every day. Whether it's someone going out of their way to help a homeless person in need, or an orangutan giving birth to their young in the forest, this world is full of beauty. The best part of it is when things happen that make you think. They make you question society, yourself, or the universe. Keep scrolling to check out these thought-provoking images. You might just be inspired to help someone, praise someone, or make a change in the world. #1. Tammy Waddell was a compassionate school teacher for 25 long years. When she passed away, her obituary was placed in the newspaper. Instead of flowers being brought to her service, she requested that backpacks filled with school supplies were brought in honor of her commitment to children. #2. One of the greatest lessons someone can learn is to give away what you're able to if helps others. This barber goes above and beyond the call of duty. 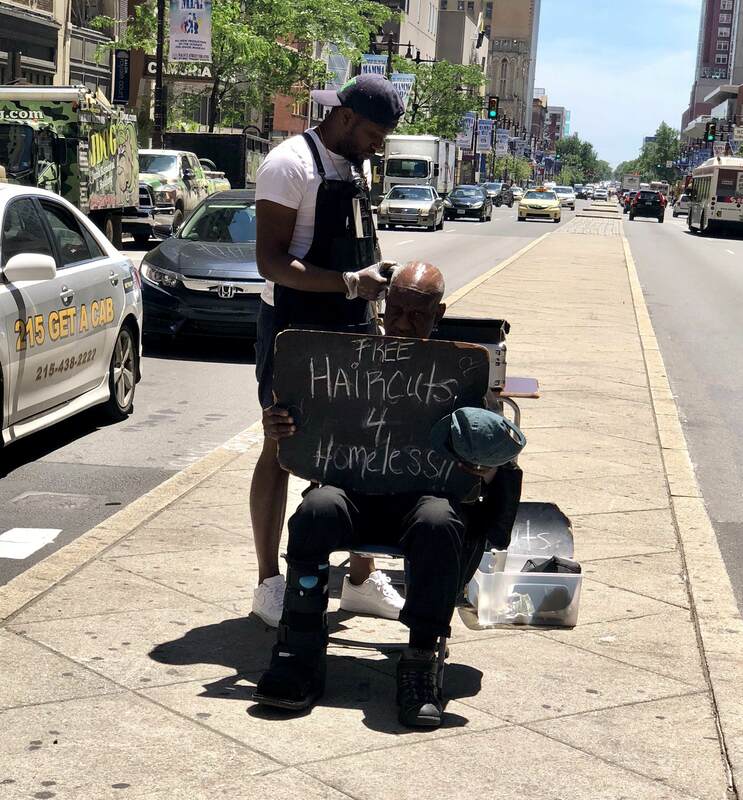 He spends his free time giving hair cuts to the homeless, free of charge. That's a sure way to use your skills to make the world a better place. #3. Can you honestly say that you've seen something cuter than this? What you're looking at is a German shepherd mixed with a Golden Retriever. We're pretty sure that none of you would pass up the opportunity to cuddle with this adorable little pup. #4. This is what it looks like when a restaurant cares about the people of their city. They decided to pave a pothole because the city couldn't be bothered to do it. And their message is very clear on how they felt about doing it. #5. Things can get pretty rough out in the middle of the ocean. Taken from a sword fishing boat off of the coast of Nova Scotia, the photographer captured the moment when orcas were breaching in rough waters. What an exhilarating moment that must have been! #11. Today is the International Save the Vaquita Day! The Vaquita are stunning porpoises that are found off of the coast of California. Unfortunately, there are only 12 of them left on this planet. Try to do what you can to help the extinction of one of nature's greatest prizes. #12. This picture proves that you're never too old to receive an education. This is a wonderful picture of a graduating class, and their 92-year-old classmate. You get it, girl! Congratulations on your achievement. #13. Discussions about climate change have been around a lot longer than you think. This newspaper article was published in August 14, 1912. Looks like we should have listened to their warning a long time ago. #14. A bunch of friends took a trip to Havasu Falls in Arizona. The photographer had all of their friends put on their headlamps while they took a long exposure photograph. The result are mind- blowing! #15. 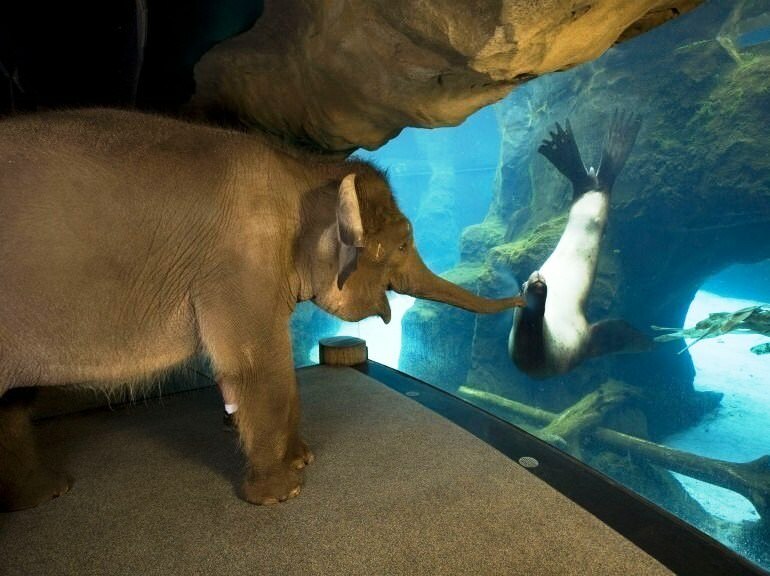 Have you ever seen an elephant flirting with a sea lion? This elephant was brought around the Oregon Zoo by animal handlers to check out the other animals. It's quite obvious that the sea lions were her favorite. #16. It's the job of a parent to make sure that their children are safe and protected at all times. This mother moose definitely understands her duties. Instead of crossing the busy highway, she decided to take her young across the bridge. What a smart mama! Previous articleHundreds Of German Shepherds Saved From Georgia Puppy Mill. Next articleThis Blind Dog Found A Forever Home And We Couldn't Be Happier For Him. 25 Chilly Photos That Show Just How Insanely Cold It Was Last Week. Cop Laughs At Walking Bear Story, Goes Home And Realizes He Should've Listened.